. . . the creative process continues throughout life. No creator is ever satisfied with what he has done. New problems constantly occur which compel him to seek new solutions. Completed works are but halts on the way; staging posts on a journey which, as in Jung’s picture of the development of personality, is never completed. Indeed the works of an artist are the outward and visible signs of his inner development as a person. The weekend was over in a hurry, and I have a long road back home. But first, I need to keep an appointment with a gallery to submit new work this afternoon, and while waiting for that to roll around, I may as well get some college work done. Monday always brings a new round of grading and posting new assignments online. These tasks will consume the larger part of today, but I choose to begin the morning with coffee and quiet time for reading and reflection. Reading the passage above from Storr’s Solitude drove me back into a stack of my old journals that I brought on the weekend trip with me. As I stated in yesterday’s blog, I have felt a renewed compulsion to explore some of my older journals as well as typed essays and scattered thoughts saved on a disk.
. . . the creative person, in the inspirational phase of the creative furor, loses his past and his future and lives only in the moment. He is all there, totally immersed, fascinated and absorbed in the present, in the current situation, in the here-now, with the matter-in-hand . . . This ability to become “lost in the present” seems to be a sine qua non for creativeness of any kind. But also certain prerequisites of creativeness–in whatever realm–somehow have something to do with this ability to become timeless, selfless, outside of space, of society, of history. Today is more “scheduled” than usual, with appointments and deadlines to meet. But still, I choose to pay myself first, to give myself the best of the morning hours, to feed on books, on journals, on thoughts, always looking for some inspirational boost. Delicious moments spent in these pursuits usually provide me with the energy and optimism to complete the compulsory tasks that are always waiting in the wings. The soft darkness and stillness of this night welcomed me back to my abandoned studio. There have been too many lengthy lapses in creative activity, thanks to school-related tasks that have driven me far from my element, and I chafe at the realization that the “system”, while crowing about “what’s best for the students” never considers the value of an instructor’s personal enrichment. To me, the development and enrichment of the instructor is by far the best gift to offer students. Way back in 1995, The National Endowment for the Humanities granted twenty-five of us the last of the Teacher-Scholar Awards (Newt Gingrich’s “Contract with America” killed the program). The award was a one-year funded sabbatical leave of absence, grounded in the philosophy that teachers are better for their students when they are granted time off for educational advancement, scholarly study or personal enrichment. In twenty-eight years, I am glad that I had that one year to re-tool and re-think what I was trying to do in the classroom. I am aware that many are quick to retort that teachers have summer vacations, but that didn’t begin happening to me until two years ago–I always taught both semesters of summer school, hence no summers off from the classroom. I have been a year-round teacher until recently. But that’s not why I’m pausing to write this night! I was fortunate to finish tomorrow’s classroom preparations with enough of an evening before me to re-enter my studio and resume work on two abandoned watercolors. I believe I have finished the still life of the doorknob and Indian corn. I only needed about an hour to stitch up some details on that large painting that had annoyed me. As for the smaller one of myself in the chair, I’m getting closer to finishing it out as well. I’m still working on me, as well as the objects surrounding me, and feel that I need one or two more sessions in the studio before I can call this one complete. I am particularly fond of working on the small composition because it was born in the cozy quiet of the store I so love to inhabit when I can get out of the city for a weekend. Every time I peer into this picture, I feel myself back in the store, back in the quiet, back in the cozy embrace of a good life. I still have not completed my reading of Faust, because I continue to pause, underline, highlight, scribble in my journal, and muse over the power of his words. When I read this line that time is brief and art is forever, my soul feels soothed. Art for me is a sanctuary. One of the portals outside the Saint Louis Art Museum reads: ART STILL HAS TRVTH. TAKE REFVGE THERE. That quote from Matthew Arnold has nourished me throughout the years. My heart vibrates when I think of the kindred spirits I know personally who enrich themselves with creative endeavors–writing, making art, playing a musical instrument, or just reading for pure pleasure and enrichment. When we are allowed quiet evenings to engage in these pursuits, we are wealthy indeed. Being back in my home is good tonight. Mozart plays softly in the background. The hot tea is soothing. I love my writing desk and library area. But in my mind’s eye, I’m still at the “store”, my favorite hideaway when I can get out of the city. I probably posted in earlier blogs (I don’t go back and read them much) that I’ve been reading a great deal about Martin Heidegger. I have zero interest in the details of his political leanings, but am intrigued with his philosophy that includes amazing insight into art, poetry and pre-Socratic thought. And I have always been intrigued with stories surrounding the cabin he had built adjacent to the town of Todtnauberg where he frequently withdrew to study and write. He did not enjoy life in the city of Freiburg where he lived and taught in the university. He later turned down the Chair of Philosophy offered to him in Berlin, because it would prevent his frequent withdrawals to his cabin. As for myself, I’m glad to have a home in the suburbs of Arlington, Texas, four minutes from where I teach. But I love so much more these three-and-a-half hour drives out of the city to a remote spot in the country, to a dirt road where no one drives by, to a spot of absolute quiet and solitude. It is in that place that my soul has been restored repeatedly. All my life I have dreamed of such a location.
. . . it is possible to consider the hut and house as talismanic for two positions decisive in Heidegger’s biography, which Albert Borgmann terms “provincialism” and “cosmopolitanism.” These positions are often considered in opposition. Tropes recur by which advocates of each position attempt to dismiss the alternative. Cosmopolitans dismiss the provincial as invidious: introvert, inbred, prone to exclusion, and reliant upon romantic myth. Provincials dismiss the cosmopolitan as deluded: bound up in abstract systems and priorities, entranced by the fickleness of fashion, setting itself and its self-appointed heroes on false pedestals. Although such polarities are inevitably caricatures, and provincial and cosmopolitan positions always remain more nuanced, their identification can be helpful. I love it when someone writes what I’ve thought about for years, and writes it so well! For twenty-eight years, I have been a citizen of both worlds–teaching in the suburban neighborhoods of a large city and withdrawing as much as possible to remote sanctuaries. Being single, I love the privacy and quiet of my home after a day in the classroom, and when I can leave the city, I look for the quietest places in the country. My life’s work has been in the public schools full time and the universities part time. When I retire at the end of May, I’ll gladly accept the offer of a neighboring university to continue teaching part time, some of it online. I am so thrilled at this new chapter, the idea of no longer being under contract from 7:15 till 3:15 five days a week. My public life in the classroom has been mostly scintillating throughout the decades–I have had an overwhelmingly positive and affirming crowd of students (probably 99.8% respectful and inspiring, only the occasional “turd”). Being an educator has allowed me to remain a student for life, which is what I truly craved–I hated the thought of leaving a life of scholarship behind after completing graduate school. How wonderful to be paid to study, to learn and share daily the things that matter to me. I cannot say enough about the richness of teaching in the areas of religion, art, philosophy and literature. Life as a public educator has been very rewarding to me. At the same time, I must confess that I am drawn to reading books like Anthony Storr’s Solitude: A Return to the Self, Susan Cain’s Quiet: The Power of Introverts in a World That Can’t Stop Talking, and William Powers’s Hamlet’s Blackberry: Building a Good Life in the Digital Age, along with the writings of Henry David Thoreau and Ralph Waldo Emerson. Long ago I came to terms with the reality that I like being alone, and crave space for such times. I have always believed that I could do my job better if I had time to withdraw and recharge my batteries. Fortunately for me, life has provided those opportunities and for the most part I have been able to avoid burnout. At age 62, I am more sensitive to the noisy clatter of school hallways, the public school obsession to call meetings, and the growing paperwork, records and accountability demanded, often by a bureaucracy that continues to create “positions” designed for compiling data and checking boxes on reports. I have never had respect for elected politicians who pass laws governing an educational enterprise that they have never themselves understood or spent time studying. And I have noticed with disdain throughout the years that they continue to pass more laws designed to cripple the work of conscientious educators, and then use the data designed to prove that public education is faltering so they can convince tax payers that schools would be better if they were run by private businesses. I have had the pleasure to work for a district that is far better than any state or federal agency can evaluate with piles of data. And I have been fortunate to work inside of schools with administrators that let the teachers do their jobs. Real education occurs inside the classroom when the teacher is freed up to study his/her area of expertise and design creative ways to share this with students primed to learn. All thinkers know this. To sum up, I am getting out at a good time; most likely I stayed too long . . . I have not been posting on the blog with much frequency of late. But after this weekend, I still have plenty on my mind, and I’m glad to have this avenue of expression. So thank you again for reading . . .
Then Samuel died and the world shattered like a dish. This sentence lingered in my consciousness all weekend while alone in the store. Painting, reading, writing and thinking sustained my spirits in the best of all possible ways the entire time, but I could not help pondering life and many of the people I know and love who share openly about these wounds that we all sustain. My closest friends know that the results of our recent election, along with its aftermath, have torn my spirit like a dull serrated knife. I find it necessary to disregard over three-fourths of facebook posts because they are talking about it–whether the posts are pro or con, the message is usually one of ugliness and hurt. And life since November has made it challenging to remain buoyant in spite of the culture that now envelops us. But the pain I read in East of Eden is much more comprehensive, the kind of pain that punctuates lives throughout their duration. During the quiet hours of the weekend, I mused over the events of a lifetime, and how many tragedies the average individual absorbs. The video by R.E.M. returned to my memory: “Everybody Hurts.” Yet through it all, we continue to walk through this life, even if we walk with a limp. And perhaps the connective tissue that binds us as humans is the mutual regard we feel, recognizing that others hurt just as we do, and we all have the capacity to reach out to one another for support and understanding. The weekend has been a real gift in that it offered space and quiet for uninterrupted thought and a chance to make some decisions that needed to be made. I make art in order to express. You're the fella moved into the old Quinn place. You moved out from the city? there's no telling where it's all gonna lead. The morning following our presidential election, I returned to work and was surrounded with teachers and students wanting to discuss the election’s outcome. This was a conversation I did not wish to engage. I took ill, and in the following days called in sick, and by the weekend decided I needed to retreat to the country. The healing balm offered by this special place and my special friends has far exceeded my expectations in providing needed rest, quiet, recharged spiritual batteries and recalibrated ideas for my future. I can return to work tomorrow, grateful for the past few days of peace. I require of any lecturer that he will read me a more or less simple and sincere account of his own life, of what he has done and thought,–not so much what he has read or heard of other men’s lives and actions, but some such account as he would send to his kindred from a distant land,–and if he has lived sincerely, it must have been in a distant land to me,–describing even his outward circumstances and what adventures he has had, as well as his thoughts and feelings about them. He who gives us only the results of other men’s lives, though with brilliant temporary success, we may in some measure justly accuse of having defrauded us of our time. We want him to give us that which was most precious to him,–not his life’s blood but even that for which his life’s blood circulated, what he has got by living. If anything ever yielded him pure pleasure or instruction, let him communicate it. I needed to read that. Having taught for three decades, and in recent years posted to a blog, I have always second-guessed how much quoting of others vs. how much personal stuff I should communicate to anyone willing to listen. My life has been stirred by what I have read of those who have traveled this life before me. And daily I seek to record my personal visions. But when it comes to blending the two, I’m never sure, and I guess I never will be. At any rate, I appreciated Thoreau’s sentiments, because I’m always fearful of putting out blogs that offer nothing more than navel-gazing. Rising from my reading, I returned to the main store counter and looked among the cans, bottles and packages on the shelf, trying to decide what to paint first. I chose this section, hoping that the bright red Coca-Cola ad would draw immediate attention to the painting, and then hoping that the coffee tin and bottle adjoining would support enough detail to satisfy the curious eye. As usual, I spent a good part of the weekend perusing Andrew Wyeth drybrush sketches, and decided to leave this one as a vignette. It is approximately 9 x 12″ so I’m seriously considering putting it into the Fort Worth CAC 9 x 12 show two days from now. They allow us to submit up to six unframed original pieces and they price them at $100 each. This sketch just might be able to find a home there. In the meantime, I’m going to enjoy looking at it, grateful for the memories it exudes. My friends also have a chuckwagon parked in a nearby barn, and have furnished me the keys the section where it is parked. For a couple of years, I have wanted to attempt sketches of it and finally worked up the nerve Saturday afternoon to visit the barn. Just as inside the store, I found difficulty narrowing down the pletora of ojects to just a few. After all, I have to return to work on Monday, and I knew I could not paint the entire scene in one day. This one I have not finished, but took plenty of reference photos in hopes that I can complete it in my studio at home. Late Saturday night, I was too wired to sleep, filled with good feelings about all that had happened during the day–fly fishing, painting, reading, journaling, sitting in a rocking chair and staring across beautiful landscape. So I returned to the front of the store and began a sketch of one of the old doorknobs and locking mechanisms on the main door connecting the store to the residential section of the building. Retiring to bed finally around 1 a.m., I thought I may sleep till noon. But I awoke at 5:40, feeling rested and energized to make something else happen before loading up and making the three-hour trek back home. After breakfast, coffee and more quality quiet reading time, I returned to the store and worked further on the painting. It still isn’t finished, but I took a good close-up reference photo of the details and will certainly finish this one. The weekend in the wilderness has done everything I wished for, and more. I think I’ll do O.K. returning to work tomorrow. I force my mind to become self-absorbed and not let outside things distract it. There can be absolute bedlam without so long as there is no commotion within, so long as fear and desire are not at loggerheads, so long as meanness and extravagance are not at odds and harassing each other. For what is the good of having silence throughout the neighborhood if one’s emotions are in turmoil? It’s about treating your mind as you would a private garden and being as careful as possible about what you introduce and allow to grow there. 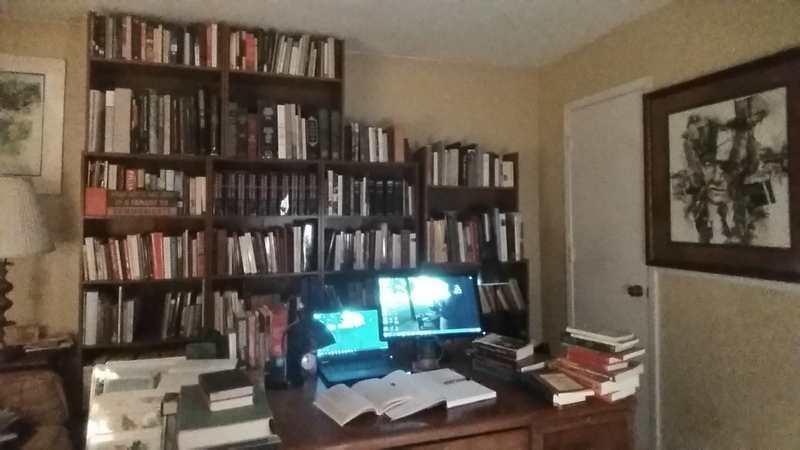 I am nearing the end of a string of delicious hours in the quiet of my study tonight. My reading has been broad, but probably the best moments were spent in William Powers’s Hamlet’s Blackberry: Building a Good Life in the Digital Age. Thanks to one of his chapters, I’ve returned to reading Seneca, and tonight uncovered a lovely article written by Jennifer Bowen Hicks: “Whispered Wills and Words That Bleed: On Transparency of Thought in the Essay” (http://www.creativenonfiction.org/brevity/craft/craft_hicks38.html). An evening like this was long overdue. The value of the lessons from Hamlet’s Blackberry, for me, is impossible to exaggerate. Time is too precious to spend abundantly on the Internet and social media. As Powers argues, flitting from link to link eliminates real depth from life, from introspection. Every four years, I manage to get pulled into election chatter, and in the final months devote what is no doubt hundreds of hours to reading articles on the Internet and listening to news outlets. Then the election comes and goes and I come away feeling I need a serious bath, a cleansing. On this, the day after, I have stayed away from social media almost entirely–almost. And now I am retreating to the wilderness to find that sanctuary I have been missing. I need to recharge some batteries and reset my compass. Finally, brethren, whatever things are true, whatever things are honest, whatever things are just, whatever things are pure, whatever things are lovely, whatever things are of good report; if there be any virtue, and if there be any praise, think on these things. Note: I’ll never have the artistic eye of photographer Cindy Sherman, but I do know how to take selfies with a 10-second timer on my phone. I was alone for the weekend, and the silence was beyond description. I don’t really have studios. I wander around people’s attics, out in fields, in cellars, anyplace I find that invites me. Since my ninth grade year, I have read of Andrew Wyeth’s focused painting adventures as a guest at Kuerner’s farm in Chadds Ford, Pennsylvania and at the Olson house in Cushing, Maine. Throughout my life I have been drawn to his subject matter because it took me back to own primal childhood memories of life on my grandparents’ farms in rural southeast Missouri. One of my most cherished memories was Marlin’s store, located in rural Jackson, Missouri, next door to McLain’s Chapel and across the road from an abandoned schoolhouse. The Marlin family lived in the rear of the store, and always I have been fascinated with stories associated with business owners living behind their store or filling station. As these memories lingered with me, I always envied Wyeth for having loving friends who opened their doors to him in that way. Well, I have recently been on the receiving end of that kind of friendship. A very dear couple living in rural Texas has invited me onto their property in time past, and this weekend they invited me to spend a weekend living in the back of their restored general store. I felt tears when I first entered the front doors and saw the kind of environment that always greeted me as a small boy inside Marlin’s. With deep-seated joy, I resided in the back of this store from Friday night till Sunday afternoon. The entire time was given to painting what I could see inside and outside the building, along with reading, thinking and journaling. Both mornings were enveloped in dense fog till around 10:00, and then the sun came out and washed the landscape in beautiful color. Besides the interior watercolor sketch, I attempted two plein air sketches, the first in the fog and the second in the clear. I cannot describe the beauty and serenity of the quiet countryside that was my home for the weekend, nor can I express the depths of my gratitude to my friends for extending to me this delightful invitation. My life has been enriched beyond description.